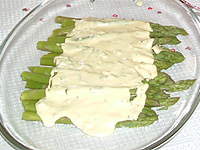 Add 2 pounds of asparagus to boiling water and cook for 4-8 minutes or until tender keep; keep asparagus warm to make the Dijon sauce: 1/4 cup mayonnaise, 1/3 sour cream, chopped green onion, and 1 table spoon of Dijon mustard. And a splash of lemon juice to thin mixture. Salt and pepper to taste.